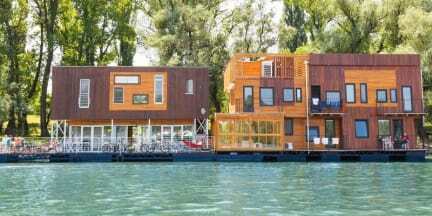 It is a FLOATING HOUSE at the river Danube situated in one of the most beautiful central park. It is unique because it combines the exotic natural feeling of the river with the urban comfort of a contemporary wooden architecture. The cozy cafe of that space is welcoming Belgradians and gives the opportunity to our guests to mingle with locals. ArkaBarka is also suitable for groups and the organization of small seminars or workshops. Really nice place along the river and nice atmosphere. We however had a room with shared bahroom and I found the shower dirty with mould causes by humidity. That's my main negative point.